Everyone wants to get the high score—that’s why pedometers are so much fun. Seeing your steps add up to that magical threshold of 10,000 (or at least more than yesterday’s total) can motivate you to take the stairs instead of the elevator, walk home instead of hop on the bus, or just work a neighborhood stroll into your evening routine. 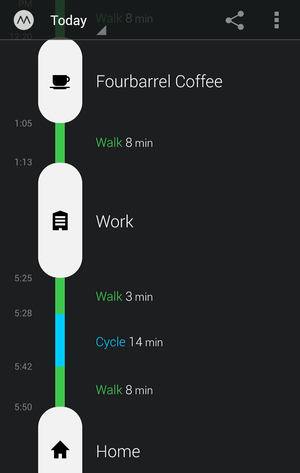 Tap anything on the Moves timeline to see it on a map. But you don’t necessarily have to spend big bucks on a wearable device to get a decent sense of how far you walk, run, and bike throughout the day, if you install Moves on your iPhone or Android phone—the Android version being brand-spanking-new as of Thursday. 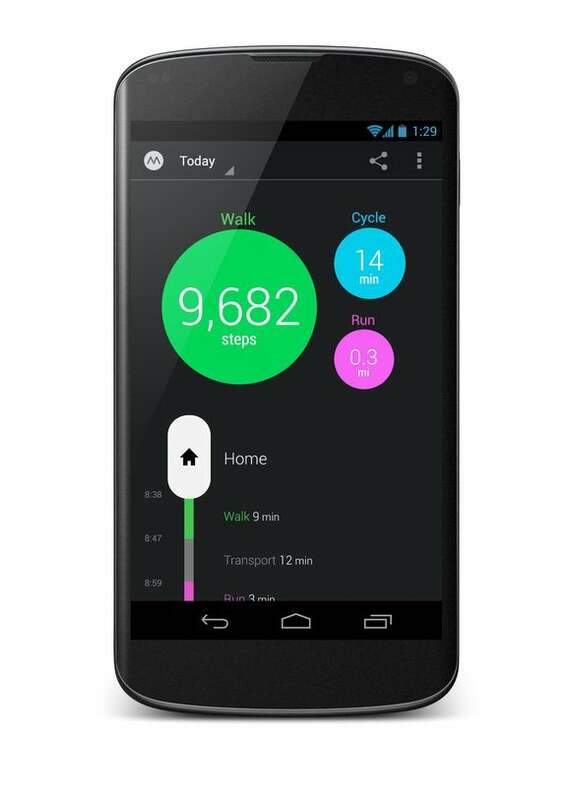 Moves does more than just measure your steps, distance, time, and calories burned. It creates a “storyline” showing exactly where you were all day, which can be all kinds of interesting: See how long your commute was, marvel (or cringe) at how many hours you spend at work, and easily recall exactly what time you picked the kids up from daycare. Moves can tell if you're walking, running, cycling, or in transit based on your accelerometer data, and you can name frequent locations, like your home, office, and favorite coffee place. It's fun to see where you've been. 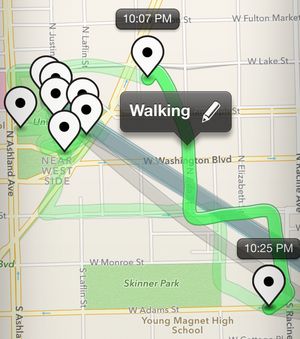 Yes, Moves uses your phone’s GPS to accomplish this, so yes, it’ll hit your battery a little harder than if you weren’t using a tracking app. But if you’re already in the habit of charging your phone nightly, you may not notice much of a difference—I haven’t. Moves is running all the time, which is why it’s so convenient (just leave it in your pocket or bag, and you’re being tracked), but it’s easy to pause if you’re desperate to save your last bits of battery life. But once you get hooked on its attractive interface and fascinating timeline graphs, you probably won’t want to. You can even export your Moves data to a generous handful of interesting apps, too, from fitness-focused GymPact to journaling apps like Grid Diary and Narrato Journal.